Baguio—Alaska Sports continued to teach the youth the fundamentals of basketball and proper values with the launch of the Alaska Basketball Power Camp 2019 here last Saturday. Alaska Basketball Power Camp Director Jeff Cariaso talks to a camp participant. 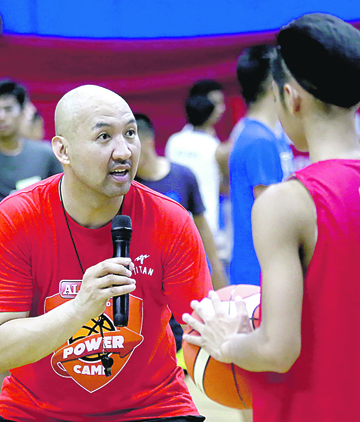 Power Camp Director, Philippine Basketball Association legend and Alaska Aces Assistant Coach Jeffrey Cariaso said the program – also with camps in Manila and Bacolod – inspires children to achieve their dreams and aspirations. “I take pride in what we do at our Alaska Power Camp. There’s emphasis and focus on skills, but on both ends of the court. We really work on offense, which is what a lot of other people do. But we also spend the same amount of time on defense. And kids feel that and they understand that it’s equally important to be able to play both sides of the court,” said Cariaso. Alaska teaches children that playing a sport is not just about winning the game. It is more important to learn the values of determination, hard work, teamwork, discipline and sportsmanship. “A big part of what we do with our Power Camp is that kids understand, and we teach them the core values that we believe in. Not only to become good athletes but also to become good people,” said Cariaso. The camp does not only drill children on the fundamentals of basketball the coaches regularly teach and impart valuable life lessons as well. “Examples of core values that we talk about each and every day are hard work, determination, discipline, respect. We take up one value daily. So every session there’s a core value word that we stress upon. And as the sessions go on we don’t forget those words and we keep adding. And we really stress that to each and every student,” said Cariaso. Alaska promotes affordable nutrition and an active lifestyle, especially for children. It hopes to teach a new generation of children become better at sport through the Alaska Power Camp. Cariaso said he was happy to be back in Baguio to meet the enthusiastic children who joined the camp. “What we like about the kids out here is that they are really passionate and they are really willing to learn. We like it that when there’s a place where we go to and kids are excited. They’re passionate about basketball,” said Cariaso. Alaska wants parents to enroll their children in the Alaska Basketball Power Camp so that they can experience the fun and benefits sports will bring. Registration form is available at www.alaskamilk.com/Alaska-sports. To join present printed registration form and proof of purchase or official receipt from February 2019 up to the start of the camp. Walk-in participants are also welcome. To learn more about Alaska Sports visit www.alaskamilk.com/alaska-sports/, www.facebook.com/alaskamilkphilippines/.